Click Here for Nadi Nameology(Nadi Numerology) Predictions. Based on the deeds of the past man takes birth on earth, The karma yoga sastra (science) says that a man should uphold the principles of Truth and Justice to attain greatness. The karma yoga has the unique power of increasing or decreasing the impact of the evil deeds (committed in the past births) in one's present life. Vaasiyogam is a class of yoga that strengthens the body, controls the breathing systems with the strength of the body, opens the third eye namely the eye on the forehead and helps one to attain greatness. It is a difficult task to master the art of Vaasiyogam, put it into practice to get the desired effect. Karma yoga sastra firmly says that the third eye of a person could be opened, only if he discharges his duties to the entire satisfaction of the God. The SIDDHAR Karma yoga Sastra prescribes certain paths that can be easily followed by people of various faiths, races and languages to attain greatness. The Siththa's (a class of Celestials) followed this path, removed the impact of the evil deeds of his past births and derived many benefits out of life. Sre Kagabujandar has advised his disciple that the SIDDHAR karma yoga path is a rare and unique path. The science of Siddhar karma yoga is a treasure acquired by the Siddhar.It is a wonderful Sastra that offer everything that they (Siththa's) wish for. Thus Sre Kagabujandar speaks about the greatness of Karma yoga in his text 'SIDDHAR karma yoga Sastra". Siddhar Karma Yoga can be divided into two parts based on the theory that causes the deed to be done and performs the deed. They are:(1) Karma yoga unto oneself (2) Karma yoga unto others. This means doing one's duty that one is bound is to do to himself or to his relatives. One should possess a good conduct in order to build up his character and abide by the rules laid down by the law of righteousness in his present birth. One should do his duty he is bound to do towards his sister, brother, father, mother, wife, uncle, children grandfather and grandmother. He should discharge his duties to the entire satisfaction of God, direct them to lead a virtuous life in accordance to the law of righteousness. He should staid as the very embodiment of the principles prescribed by the treatise and therefore instill them to do good deeds in all the ways they can in order to enable them to reap the benefits out of life. Thus he should ultimately make them devoted followers of the Science of Karma yoga. Thus, "The Universal Supreme Preceptor Sre Kaagabujandar" speaks about "Siddhar karma yoga unto oneself in his treatise on karma yoga. Thus, the treatise contains the direct advice of The Supreme Preceptor of the Universe - "Sre Kagabujandar" to his kind disciple Sre Gorakkar. Karma Yoga unto others is discharging duty to other souls who are not related to us. A person who follows Karma Yoga should possess a good conduct and character and adhere the path of righteousness. Apart from this he can advice those who are friendly with him to follow the path of righteousness and make abide by the rules laid down by the principles of Truth and Justice. One should make others to do their duties properly in order to reap the benefits of good deeds and thereby enable them to lead an ideal life. Thus, The Supreme Preceptor of the Universe - "Sre Kagabujandar" in his text lays emphasis on "Karma yoga unto others" in his advice to Sre Gorakkar. The first step in Karma yoga is to bring our mind to concentrate on one idea. This bringing of the mind to concentrate on one thing is called as meditation. In order to control the mind, which always think of so many things at the same time, and enlighten it one should do meditation. When the mind is clear the seeds of devotion can be easily sown in the field of the mind. As a seed of devotion, one should accept any one of the Gods as his preceptor (Guruji) and begin to worship Him. The Supreme Preceptor of the Universe - "Sre Kagabujandar "has thus advised his disciple Sre Gorakkar on the first step on Karma Yoga. The second step in Karma Yoga is love for mankind. With the guidance of the Preceptor (Guru) one should think about the greatness and setbacks of the other creations of God. One should impress in one's mind the greatness present in the creatures, as creatures they are the very embodiments of righteousness. One should be clear in mind, about how one can discharge his duties to others also do their duties properly in order to earn the fruits of the good deeds according to the science of Karma Yoga. This is the second step advised by The Supreme Preceptor of the Universe - "Sre Kagabujandar " to his disciple Sre Gorakkar. When one follows Karma Yoga and leads an ideal life, the evil deeds of his past births have an impact on him and prevent him from discharging his duties as prescribed in the text (Karma Yoga) by subjecting him to tests and ordeals in his present life. In such cases, the man in question must approach his Preceptor (Guru), get the blessings of the Preceptor (Guru) and the deity, and continue to follow Karma Yoga without the presence of any flaw. Moreover one should keep a constant touch with the Siththa's (Who belongs to a class of Celestials and are the very embodiment of righteousness) and receive their blessings. By doing so, one can lessen the impact of sin committed in the past births attain fulfillment in Karma Yoga reap the best benefits offered by Karma Yoga and achieve greatness in life. The Supreme Preceptor of the Universe - "Sre Kagabujandar "has advised his disciple that, if a person receives the above seven Mantra Theetchai's (Sacred formula for the invocation of the Deity) through his Preceptor (Guruji) in the prescribed manner, abide by the the rules laid down by Science of Karma Yoga in the performance of his duties unto himself and the others he can certainly free himself from rebirths and get Salvation. The Supreme Preceptor of the Universe - "Sre Kagabujandar " who is a 'Karpagavirutcha tree' (a celestial tree that offers what a person wishes for) appeared to Bhaaskharamaharishi in his dream, blessed him with seven Theetchai's. More over, he bestowed on him by touch (Sparisa Theetcha). Sre Kagabujandar instructed the Bhaaskharamaharishi to give complete details on the seven paths to devotees who have a high regard for him. Peoples who wish to get such advice should bow down their heads, in reverence to receive the Theetcha.Now, let us look into the seven fold paths of Theetchai's. The "ohmkaara Theetcha" contains the secrets of the five types of powers present in the sacred syllable-"ohm". The five sacred powers of the Theetchai's are Mantra Brahmmam, Kiriya Brahmmam, Thathva Brahmmam, Beeja Brahmmam and Muga Brahmmam. The "Sadaatchara Theetchai" contains the secrets of the six types of powers present in the sacred syllables-"Saravanabava". The six sacred powers of the Theetchai's are Sagaaram, Ragaaram, Vagaaram, Nagaaram, Bagaaram, and Vagaaram. The "Boga Panchaatchara Theetchai" contains the secrets of twenty-five types of pleasure powers present in the twenty-five types of sacred syllables of Panchaatchara Mantras (five sacred letters). The "Thoola Panchaatchara Theetchai" contains the secrets of twenty-five types of Medicinal powers present in the twenty-five types of sacred syllables of Panchaatchara Mantras (five sacred letters). The "Suukkuma Panchaatchara Theetchai" contains the secrets of twenty-five types of Enlightening powers present in the twenty-five types of sacred syllables of Panchaatchara Mantras (five sacred letters). The "Kaarana Panchaatchara Theetchai" contains the secrets of twenty-five types of breathing powers present in the twenty-five types of sacred syllables of Panchaatchara Mantras (five sacred letters). The "Mukthi Panchaatchara Theetchai" contains the secrets of twenty-five types of Salvation powers present in the twenty-five types of sacred syllables of Panchaatchara Mantras (five sacred letters). Click Here to Sage Sre Kagabujandar Guru Temple Project Work. 'The Supreme Preceptor of the Universe' - "Sre Kagabujandar " instructs to Sre Gorakkar through his text "Karma Yoga Sastra" that 'Sre Harishchandra (Sathya Harishchandra)'is the only permanent head of Karma Yoga. The events in the life history of Sre Harishchandra (Sathya Harishchandra) date back to many thousands of years. Being a divine history it it continues to have its impact on lives even today. It is therefore an ancient divine history, which upholds Truth and Justice and lives even today. One day, the Celestial assembly (Divine assembly) comprising of Celestials headed by Lord Devendran assembled for a purpose. All the Celestials beginning from Brahma, the creator; Shiva, the destroyer; and Vishnu, the protector and all other Celestials belonging to the Divine family gathered for the meeting. Acting on the instructions of his wife Indirani, Devendiran said that he had a doubt. He also added that if anyone present in the gathering clarifies his doubt he should be pleased. The members present in the court (Divine assembly) agreed to his proposal. Then, Lord Devendra addressed the gathering and asked them if there was anyone present in this universe (fourteen worlds) who is Truthful and Just in the true sense of the word and abides by the rules laid down by the Manu needhi Sastra (science of justice). Sage Vasishta stood up and said 'Oh honorable Devendra'! My disciple Sre Harishchandra (Sathya Harishchandra), the ruler of 'Ayodhya', and the son of king 'Thirisangu' who belongs to Sun race is the only person in this universe comprising '14 ' worlds who could be rightly called as the very embodiment of Truth and Justice.Devendran was greatly pleased with the Sage's reply. On hearing Sage Vasishta's reply, Sage Viswamithra became jealous and objected to what Sage Vasishta had stated. Sage Viswamithra leveled his objections against what had been said about Sre Harishchandra (Sathya Harishchandra) (by Sage Vasishta) by saying that Sre Harishchandra (Sathya Harishchandra) is not a righteous person; he does not adhere to principles of justice and is a liar. Thus, Sage Viswamithra accused Sre Harishchandra (Sathya Harishchandra) of possessing many vices. Devendran who was confused with the speeches of Sage Vasishta and Sage Viswamithra looked at them and requested them to prove what they had stated. Sage Vasishta rose up and said, "Your Highness I can firmly say that my disciple Sre Harishchandra (Sathya Harishchandra) who is undoubtedly an honest person". This is an accepted truth known to the world; but it is my duty to prove to the Celestials (Deva's) that Sre Harishchandra (Sathya Harishchandra) is a truthful and a just person. If Sage Viswamithra proves that Sre Harishchandra (Sathya Harishchandra) is a untruthful and an unjust person, I shall offer half of my strength acquired through penance, carry a pot of liquor and proceed towards the north and seek an atonement for my sins". Then Sage Viswamithra rose up and said "Your Highness I can prove that Sre Harishchandra (Sathya Harishchandra) is an unjust who does not adhere to righteousness. Therefore I request you not adjourn the court even if it takes years to prove what I have stated." In addition to this, I want the Celestials (Deva's) to be entirely at my service. They should come and assist me without hesitation, when I call them at any moment, and they must act accordingly to my instructions when needed, and thereby help me to prove what I had stated. Sage Vasishta should not leave the court of Celestials (Deva's) and go away to any other place till my return, Sre Harishchandra (Sathya Harishchandra) should not be informed of the proceedings of the court. If I fail in my attempt to prove that Sre Harishchandra (Sathya Harishchandra) is an untruthful person and a liar, I shall offer half of my strength gained through penance to Sage Vasishta and with a pot of liquor I shall precede towards the south as atonement for my sins. Devendra who paid heed to the promises made by the two Sages, asked to prove the charges leveled by them. Sage Viswamithra took Lord Yama and lord Sukra (Lord Venus) along with him to assist him in the task that he had undertaken and reached Ayodhya. (A kingdom of the earth) While 'Sre Harishchandra (Sathya Harishchandra)' was ruling Ayodhya with 'Sathyakeerthi' as his Prime-minister and leading a happy, peaceful life with his wife 'Chandramathi' and his son 'Logidhaasan'. Sage Viswamithra stepped into the court of 'Ayodhya'. Sre Harishchandra (Sathya Harishchandra) who was delighted to see Sage Viswamithra went up to Sage Viswamithra with his Prime minister Sathyakeerthi, his wife Chandramathi and his son Loghidaasan to accord a very warm welcome to him and asked him to sit on the throne. Sre Harishchandra (Sathya Harishchandra) bowed to Sage Viswamithra and told him that he was eager to know of the purpose of his visit to Ayodhya. Sage Viswamithra who was bent on putting Sre Harishchandra (Sathya Harishchandra)'s truth to test got ready to execute the first step of his plan. Sage Viswamithra looked up at Sre Harishchandra (Sathya Harishchandra) and said "Oh King Sre Harishchandra (Sathya Harishchandra)! You live and adhere to the principles of Truth". With a view to promote the welfare of the people in the world, I have planned to perform a Divine sacrifice (Yaga) for the performance of which, I require a large quantity of gold. Sre Harishchandra (Sathya Harishchandra) replied that it was in fact a good deed to donate for a noble cause (for human welfare) and promised to donate gold for the purpose. He urged Sage Viswamithra saying "Kindly tell me immediately the quantity of gold you needed, and I shall gladly offer it to you at once". Sage Viswamithra who heard Sre Harishchandra (Sathya Harishchandra)'s words which were binding on the principles of Truth and Justice began to state the amount of gold that he required. He said thus: "If a young man sits on an elephant which is made to stand on a circular rock, and if an arrow is shot from a bow into the air by him, the arrow will reach a considerable height before it falls to the ground". He stressed that he needed gold to the extent the arrow will reach in such a case. Sre Harishchandra (Sathya Harishchandra), who always keeps up his words, submitted the required quantity of gold at the Holy feet of the Sage. Sage Viswamithra looked up at Sre Harishchandra (Sathya Harishchandra) and said,"Oh King! You follow the path of righteousness". I' am in hurry to go to another place right now. Therefore, I cannot take such an enormous quantity of gold with me at this moment. Therefore, I shall first decide the day on which the Yaga (Divine sacrifice) is to be performed and then I shall come here to receive them (required quantity of gold) from you. Till then, I request you to keep them safely in a special cupboard of the treasury and label the cupboard as "Sage Viswamithra's treasury". With these words, Sage Viswamithra took leave of Sre Harishchandra (Sathya Harishchandra) and left the palace. Sage Viswamithra, who had planned different ways to test Sre Harishchandra (Sathya Harishchandra)'s truth, got ready with the second step of his plan. With the power of his severe penance, Sage Viswamithra created two beautiful young maids (young girls). He then instructed them to go to Sre Harishchandra (Sathya Harishchandra)'s court, please Harichandra by exhibiting their talents at dance and music. He insisted that they should entertain Harichandra in such a way that a lust for them develops within him. Then they must throw a scandal on his morality by engaging him in sexual pleasures with them. In case they fail in their attempt of making Sre Harishchandra (Sathya Harishchandra) severe from the path of righteousness, they should at least get the 'wheel of flowers', the symbol of truth, which rotates above his throne to ensure that Truth reigns his kingdom from him as a prize. In case, you are unable to receive the 'wheel of flowers' from him get at least a lie from his lips and march triumphantly to this place. Acting on the orders of Sage Viswamithra the maids set out for Ayodhya to do the allotted task. The maids reached the palace of Ayodhya and introduced themselves as maids who came from the north. They expressed their desire to exhibit their talents in the great arts of dance and music in the presence of the king and win prizes. Sre Harishchandra (Sathya Harishchandra)'s Prime Minister Sathyakeerthi informed Sre Harishchandra (Sathya Harishchandra) of the desire of the maids. King Sre Harishchandra (Sathya Harishchandra) who complied with the request of the maids, asked Sathyakeerthi to make the necessary arrangements for staging their performances. Having exhibited their talents in the respective arts on the stages, they approached Sre Harishchandra (Sathya Harishchandra), touched his Holy feet and paid their respects to him. Sre Harishchandra (Sathya Harishchandra)then said to the maids, "What do you want as a prize?" The maids in turn asked Sre Harishchandra (Sathya Harishchandra) if he would be willing to give any prize that they wished for. Sre Harishchandra (Sathya Harishchandra) replied that he certainly offer them a fair prize that would suit his pocket, not exceeding the limits prescribed by the principles of Truth and Justice. He added that having understood what he had said, they could ask for a prize they wanted. The maids insisted that, they wanted Sre Harishchandra (Sathya Harishchandra), Himself to be offered as a prize to them. Therefore he should engage in sexual pleasures with them in order to satisfy their lust. Sre Harishchandra (Sathya Harishchandra)'s reply was "My dear maids, I' am man of practicing monogamy, I can not touch any other lady other than Chandramathi even in thoughts. Therefore, it is not right on your part to ask me to offer myself as a prize because I belong to Chandramathi. "Therefore, he requested them to ask for some other prize which would be offered to them. The maids then asked Sre Harishchandra (Sathya Harishchandra) for the 'wheel of flower' (the symbol of truth) which always goes on rotating on his throne. Sre Harishchandra (Sathya Harishchandra) replied that the rotating wheel of flower on the throne does not belong to me. Therefore I have no right to offer the wheel of flower, which belong to my subjects. (Citizens) The wheel of flower signifies that Truth reigns my land. The act of taking it away from its place on the throne would mean that Truth has died away and falsehood would come to occupy the place. Ask for some other prize, I shall gladly offer it to you because I Sre Harishchandra (Sathya Harishchandra) is a person who keeps up his promises irrespective of the prevailing circumstances. The maids finding themselves at their with end, asked Sre Harishchandra (Sathya Harishchandra) to utter a lie (i.e. he is incapable of offering a prize) which should be acknowledged by them as a prize. Sre Harishchandra (Sathya Harishchandra) then said to them" Ask me a fair prize that befits a man who upholds Truth and Justice". The maids who failed in their repeated attempts make him severe from the path of righteousness said that they did not want any prize and left the palace. The maids went to Sage Viswamithra and informed him of everything that had passed between them and the Sre Harishchandra (Sathya Harishchandra). Sage Viswamithra who realized that he did not succeeded in getting the desired result through his second step, got ready with his third step in putting Sre Harishchandra (Sathya Harishchandra)'s truth to test. With the help of the Celestials Sage Viswamithra created many animals commanded them to go to Ayodhya and destroy the crops grown there. As desired by Sage Viswamithra the animals destroyed the crops in Ayodhya.The peoples (Sre Harishchandra's subjects) went to Sre Harishchandra (Sathya Harishchandra) and reported to him about the destruction of crops caused by animals. Sre Harishchandra (Sathya Harishchandra) offered large quantities of gold to the people in order to manage the crisis in his kingdom. Thus, Sage Viswamithra who met failure in his successive attempts of his plan got ready to execute the fourth step of his plan. Sage Viswamithra called Lord Varuna and asked him not to send rain to the kingdom of Ayodhya.Ayodhya was experiencing a period of drought. People came to Sre Harishchandra (Sathya Harishchandra) and complained to him of their plight. Harichandra (Sre Harishchandra) offered large quantities of gold to the people and put an end to the miseries of the people. Sage Viswamithra then got ready with the fifth step of his plan. Sage Viswamithra approached Harichandra (Sre Harishchandra) and asked him for a donation. Harichandra (Sre Harishchandra) bowed in respect to Sage Viswamithra and said "o great Sage! Ask me whatever you wish and it shall be granted to you. Sage Viswamithra looked up at Harichandra (Sre Harishchandra) and said.' I want you to offer me this land of Ayodhya known for It's righteousness as a donation'. Sre Harishchandra (Sathya Harishchandra) readily brought gingilly seeds and water and libations of water to the departed manes, and was done which was the practice according to the Hindu custom to show that one has really parted with something. Sage Viswamithra told Sre Harishchandra (Sathya Harishchandra) that the land, which had been inherited by his father at one time, is at present being possessed by him (Harishchandra). According to the Law, the grandfather's property has to be handed over to his grandson. Thus his son will ultimately own this kingdom too. So, Sage Viswamithra insisted that Sre Harishchandra (Sathya Harishchandra) 's wife and son should come forward to donate the kingdom to him. Sre Harishchandra (Sathya Harishchandra) called his wife and son and made them donate the kingdom to Viswamithra. Viswamithra who was very pleased with (Sre Harishchandra) asked Sre Harishchandra (Sathya Harishchandra) to crown Him king of the land in the presence of his subjects (citizens). With immense pleasure Sre Harishchandra (Sathya Harishchandra) crowned Sage Viswamithra as King of Ayodhya.The people who came to understand that Sre Harishchandra (Sathya Harishchandra) in his endeavor to uphold Truth did not go back on his word or utter a lie. They felt a throb in their hearts and wept bitterly when they saw with their own eyes, the kingdom of Ayodhya being donated by Sre Harishchandra (Sathya Harishchandra) to Sage Viswamithra. Sre Harishchandra (Sathya Harishchandra) consoled his people saying," You too adhere to the path of righteousness as I do". Therefore you should not think over the deed I had done and feel upset. Therefore I want all of you (My subjects) to unanimously acknowledge Sage Viswamithra as your king and become his obedient subjects (citizens). The people promised to abide by his words, and act accordingly. Viswamithra who ascended the throne of Ayodhya was ready with the sixth step of his plan. He looked up at Sre Harishchandra (Sathya Harishchandra) and said,"Oh Harishchandra! Your kingdom now belongs to me, so you must not stay in this kingdom any more. Your whole family must leave this place. Sre Harishchandra (Sathya Harishchandra) bowed in reverence to Sage Viswamithra, beckoned his wife and son and got ready to leave the kingdom. The subjects (people of Ayodhya) prevented Sre Harishchandra (Sathya Harishchandra) from leaving the kingdom. Sre Harishchandra (Sathya Harishchandra) spoke about the greatness of Manuneedhi Sastra (science of justice) consoled them, prepared himself for the worst and turned his steps away from Ayodhya. Sage Viswamithra was now ready with the seventh step of his plan. As Sre Harishchandra (Sathya Harishchandra) was making his way out of his kingdom, Sage Viswamithra stopped him. Sre Harishchandra (Sathya Harishchandra) immediately asked him what he wanted. Sage Viswamithra looked at Sre Harishchandra (Sathya Harishchandra) and said at one instant I came to you and asked you to donate gold in order to perform yaga (Divine sacrifice) for the benefit of men on the earth. You instantly offered me gold in abundance. Then I told you that I could not carry such an abundant quantity of gold, so I asked you to keep it safely in your treasury. At present, I' am in need of riches in the form of gold. Therefore I ask you to return them to me now and then get away from my kingdom. Sre Harishchandra (Sathya Harishchandra) 's reply was: "The riches and gold given to you still lies in the treasury. Since you are the king of Ayodhya now, you can take them from the treasury." Sage Viswamithra sternly said to Harishchandra,"I have become the ruler of Ayodhya.Thus it stands to reason that everything in the land belongs to me alone. Go by your promise and give me, my due as justice demands of you and then quiet from this place". Sre Harishchandra (Sathya Harishchandra) looked up at Sage Viswamithra and said,"O Sage Viswamithra I do not possess even a pie I have to toil hard earn income in order to repay your debts. Therefore give me some time i.e. a period of '48' days so that I can search for a job in another kingdom, get employed and earn money to clear off your debts. Viswamithra complied with Sre Harishchandra (Sathya Harishchandra)'s request and said," I shall send an agent to you, through whom you can offer the riches you owe me". Sre Harishchandra (Sathya Harishchandra) agreed to act accordingly. Having lost Ayodhya, Sre Harishchandra (Sathya Harishchandra) starved with his family for many days. Sre Harishchandra (Sathya Harishchandra) seemed to look like a beggar roaming through the streets with his wife Chandramathi and his son Loghidaasan.As they were heading for Kaasi (Varanasi - Banaras) they came upon the banks of the River Sarayu and stayed there. At this point the agent sent by Sage Viswamithra approached them, introduced him self as the agent named 'Natchathreyan' sent by Sage Viswamithra to get the riches due to Sage Viswamithra. Sre Harishchandra (Sathya Harishchandra) humbly requested Natchathreyar to wait for a few days, during which he would find a job earn money in order to return him, his (Viswamithra's) due and requested him to travel with them, in order to serve the purpose. Natchathreyar who went along with Sre Harishchandra (Sathya Harishchandra) gave immense trouble to Sre Harishchandra (Sathya Harishchandra) in the course of their journey. At one instant Natchathreyar said that he could not walk up any further, and asked Sre Harishchandra (Sathya Harishchandra) to carry him over his shoulders. Sre Harishchandra (Sathya Harishchandra) looked at Natchathreyar and said," My son Logidhaasan has crossed many rough paths on his way through the forest. He has become tired and hungry so I carried him over my shoulders. Now tell me how is it possible for me to carry you too?" Natchathreyar turned to Sre Harishchandra (Sathya Harishchandra) and said," Either carry me over your shoulders or tell me a lie that you are incapable of paying off what you owe Sage Viswamithra.I shall not trouble you any longer, but I shall retreat". Sre Harishchandra (Sathya Harishchandra) puzzled on hearing the words of Natchathreyan said," I shall not go back on my word. I shall certainly give you what I have owed your master. You can sit over my shoulders". With Natchathreyan on his shoulders he preceded his journey. Natchathreyar continuously troubled him saying that he was constantly feeling hungry and asked Sre Harishchandra (Sathya Harishchandra) to fetch him some dry food. Sre Harishchandra (Sathya Harishchandra) wandered through the forest and with great difficulty he managed to get some dry food to satisfy Natchathreyan's hunger while his wife and child starved. After having traveled on foot for many days, they reached Kaasi (Varanasi - Banaras). Natchathreyan informed Sre Harishchandra (Sathya Harishchandra) that the period of time allotted for paying of his debts was drawing to a close. He urged Sre Harishchandra (Sathya Harishchandra) to find a means to earn riches. Sre Harishchandra (Sathya Harishchandra) 's virtuous wife who struck on an idea looked up at Sre Harishchandra (Sathya Harishchandra) and said,"O Lord shall tell you a way, out of this critical situation". She insisted that he should listen to what she has to stay and act accordingly." Sre Harishchandra (Sathya Harishchandra) too agreed to act accordingly. Chandramathi slowly said to Sre Harishchandra (Sathya Harishchandra) , "Therefore many Brahmins in the streets of Kaasi (Varanasi - Banaras) who may need slaves to work for them. Sell me to them as a slave, and shall work for them throughout my life. The gold, you can get return will enable you to settle your debts". Sre Harishchandra (Sathya Harishchandra) felt very sad to think the course that fate had taken for the worse. Finding no other means to pay his debts, he accepted the idea put forth by his wife. Sre Harishchandra (Sathya Harishchandra) went through the streets of Kaasi (Varanasi - Banaras), shouting out the price of Chandramathi.The people of Kaasi (Varanasi - Banaras) were bewildered to see a man crying out the price offered for the sale of his own wife. The people they're said," we have seen men giving away animals or things away for sale"." What a wonder? Has the cruel fate driven him to the extent of selling away his wife too?" A Celestial being came in the form of Kalakanda Iyyar offered the required quantity of gold to Sre Harishchandra (Sathya Harishchandra) as a price for taking his wife (Harishchandra's wife) as a slave. Adhering to the law of righteousness Sre Harishchandra (Sathya Harishchandra) permanently entrusted Chandramathy to Kalakanda Iyyar.Kalakanda Iyyar wanted Sre Harishchandra (Sathya Harishchandra) 's son Loghidaasan also to be his slave. He gave an explanation saying," When a Cow is sold to a person, the calf of the Cow ultimately belongs to the person who has bought the Cow". So, he requested Sre Harishchandra (Sathya Harishchandra) to entrust Loghidaasan to him. Sre Harishchandra (Sathya Harishchandra) who always uphold Truth and Justice as befits a follower of Manu Needhi Sastra (science of justice) permanently entrusted his son to Kalakanda Iyyar. Sre Harishchandra (Sathya Harishchandra) who lost both his wife and son at the same time was filled with grief. He gave away the gold realized from the sale of his wife and son to Natchathreyar for settling his debts. Natchathreyan was happy and took leave of Sre Harishchandra (Sathya Harishchandra) . Harishchandra not knowing what to do continued his journey. Natchathreyar stopped Sre Harishchandra from proceeding any further and said," Sir, You have paid the amount you owe to Sage Viswamithra, But I have traveled with you for many days, underwent suffering in order to get the riches you owe Sage Viswamithra.Therefore I request you to pay me my brokerage before you leave the place." What is your brokerage? Asked Sre Harishchandra (Sathya Harishchandra). Natchathreyar answered that Sre Harishchandra (Sathya Harishchandra) should pay him sixteen thousand gold coins as his brokerage. Sre Harishchandra (Sathya Harishchandra) agreed to pay the required quantity to Natchathreyar. Sre Harishchandra (Sathya Harishchandra) who has become a solitary man, decided to sell himself to get the required quantity of gold. He went through the streets of Kaasi (Varanasi - Banaras) shouting out the price offered for selling Himself. Nobody came forward to buy Him. As a last resort, he went to the parts of the City where men of low birth resided and began to shout out the price. Finally Veeravaagu, who was the chief guard of the main graveyard at Kaasi (Varanasi - Banaras), bought Sre Harishchandra (Sathya Harishchandra) for sixteen thousand coins of gold. Sre Harishchandra (Sathya Harishchandra) happily gave away the gold got to Natchathreyan.With all his heart Natchathreyan accepted the quantity of gold given to him. When this was the state of affairs prevailing at that time, it so happened that on a no-moon day the Brahmin family was in need of Kusa grass to perform their rituals on that day. So they sent Logidaasan along with other Brahmin boys to cut the kusa grass from the woods. When Logidaasan was in cutting Kusa gross a serpent bit Logidaasan.Logidaasan carried out in pain "Oh Father! Oh Mother! Hearing the scream other Brahmin boys rushed to the spot. Logidaasan asked them to report the matter to his Mother and with the words "I shall not remain alive", Logidaasan passed away. The Brahmin boys placed the dead body of Logidaasan under a Banyan tree. Then they gathered the leaves of the Senna plant dropped them throughout their path from the place where Logidaasan's dead body lay till the house of Kalakanda Iyyar.Finally, the boys reached Kalakanda Iyyar's house and told the news of Logidaasan's death to Chandramathi and added that She could easily spot the place where the dead body lay, following the path strewn with the Senna leaves. Having reported the news of Logidaasan's death the boys left for their homes, as it was nightfall. When the news of Logidaasan's death reached Chandramathi she started weeping bitterly, She cried out,"O Logidaasan! You are the only heir to the Soorya (Sun) race. But you are no longer alive. My dear son! What reply shall I give your father when he comes to redeem me?" She expressed the grief in her heart by saying, "How well I bought you up! Your father was very delighted on the day that you were born. He provided free meals, gave away Cows and dress for the sake of charity. Thus, He gave away many things to the team of so many millions to celebrate the day. Did even the good deeds fail to protect you from the icy of death? Was the Deity of righteousness asleep when death came to you? Thus, Chandramathi rose up, went to her master and humbly begged him to grant her permission to have a last look at her son. Kalakanda Iyyar granted her permission to leave the premises. Immediately She hurried to the spot where her son lay by making her way along the path strewn with Senna leaves. She looked at the dead body of her son and spoke in prouds of the Child's paternal grandfather, Thrisangu who was the ruler of a vast empire and his ancestors who belonged to the great Surya (Sun) race. She said that they followed the path of righteousness in their lives. She grieved to think that Fate had laid its hands on him, who hailed from a very powerful race." Did Lord Parameshwara die away? Did justice too die away?" she cried. 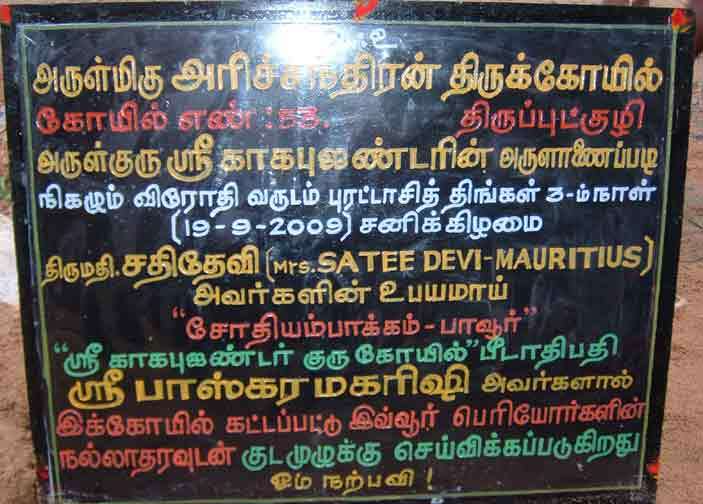 Chandramathi expressed her deep sorrow through her words. Having cried over the corpse of her son for hours together, she thought that it was time that she consoled herself. She had return to her master's house before midnight. She carried the corpse of her son over her shoulders and proceeded to the main graveyard at Kaasi (Varanasi - Banaras).Having reached the graveyard she laid the corpse on the ground to reset. 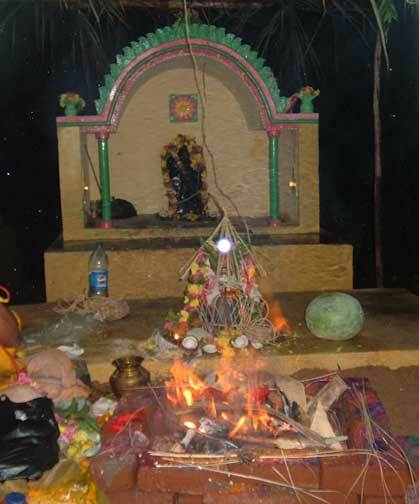 Then she collected some firewood arranged them on her son's body, She meditated on the preceptor (Guru) of her ancestors namely Sage Vasishta and the first preceptor (Guru) of the Surya race (Sun race) Sage Sambuga set fire to the corpse. At that very instant Veeravagu's slave namely Sre Harishchandra (Sathya Harishchandra) who was the chief guard of the main graveyard to appear on the scene. He noticed someone setting fire to a corpse immediately rushed to the spot, put on the fire and stopped the cremation of the body. Sre Harishchandra (Sathya Harishchandra) and his wife could not recognize each other because it was years since they had met each other. More over, the hard labor they had under taken low and menial task brought a complete change in their very countenance so much so that each considered the other as a stranger. Sre Harishchandra (Sathya Harishchandra) looked at chandramathi and said,"Oh Lady! How can you cremate the dead body of your son without my knowledge? I' am the person who guards this graveyard. Sre Harishchandra (Sathya Harishchandra) then firmly said to Chandramathi who stood before him," Only if you pay me the fee (a meter of cloth, rice and one quarter of a rupee) the body will be cremated". Chandramathi at once replied "Ican not afford to pay your fee since I have no kith and kin. I' am a solitary person, who does not have any source of income. Sre Harishchandra (Sathya Harishchandra) enquired her about the where about of her husband. Chandramathi then said "I have a husband but I' am no longer under his protection". Finding no other means to got her purpose served she pleaded with Sre Harishchandra (Sathya Harishchandra) to cremate her son's body without accepting a fee in return for the task. By chance Sre Harishchandra (Sathya Harishchandra) noticed the wedlock (a sacred thread worn on the neck) glittering on her neck and said, "If you sell the wedlock, it will fetch a high price and of it would enable you to pay me my due". Chandramathi was taken aback wept aloud on hearing what Sre Harishchandra (Sathya Harishchandra) said." My symbol of chastity which had not been visible even to the Celestials living in the fourteen worlds except my husband has now become visible to a man who guards the graveyard. She cried with the words "What a cruel Fate? How can I bear this sorrow?" Chandramathi fainted land and fell down on the ground. Harichandra (Sre Harishchandra) who heard the words of Chandramathi pondered for a while and said," Can this lady be my wife Chandramathi herself"." It is true that Chandramathi's wedlock alone possesses the power of being invisible to everyone except her husband." Under the impression that he was the only person in the world who faced difficulties in life, he was surprised when he came to understand that the lady to whom he is speaking undergoes greater sufferings in Life than himself, and sprinkled water on her in order to make her recover her consciousness. Sre Harishchandra (Sathya Harishchandra) who grew impatient to gain knowledge about Chandramathi said,"O Mother! Who are you? Which is your native land? How did your child die? give me a detailed explanation about yourself. Chandramathi looked at Sre Harishchandra (Sathya Harishchandra) and began to narrate her tale of woe." I was born to King Mathitheya the ruler of Kannamapuri as a result of his severe penance and I was the only daughter born to him. According to Divine secrets I had got married to my husband Sre Harishchandra (Sathya Harishchandra) when I was just a child. The wedlock tied on my neck by my husband glittered better each day. When I attained adolescence my father held a Suyavaram (marriage function). The only son of the emperor Thrisangu who ruled Ayodhya married to me. His name is Sre Harishchandra (Sathya Harishchandra) who was known for Truth and Justice. All the Celestials were present for the marriage function. The Celestials revealed the Divine secret to us (Harichandra and myself) that we had got married to each other during our childhood and firmly asserted that my wedlock would be visible only to my husband and to no one else. The Celestials blessed us with a happy and prosperous life and left their heavenly abode. After the wedding, my husband ruled Ayodhya abiding by the law of righteousness. When he was ruling Ayodhya ably and Justly, Sage Viswamithra who was jealous of us played a trick on us and we lost everything we possessed. Now, I lost my only son too because he had been bitten by a snake." Thus, Chandramathi powered out her heart in her narration. Sre Harishchandra (Sathya Harishchandra) jumped to his feet and said," O Chandramathi! I' am your husband Sre Harishchandra (Sathya Harishchandra) .Is our son dead? What shall I do?" said Sre Harishchandra (Sathya Harishchandra) and dropped the stick used to cremate the body and began to weep bitterly. At length Harichandra (Sre Harishchandra) consoled himself and began to talk to his wife. He said to his wife," You need not give me rice which you owe me, but you must make arrangements to get a meter of cloth and a coin which are to be given to my master to cremate our son". Filled with grief Sre Harishchandra (Sathya Harishchandra) said, "I' am a person who does not fail to uphold Truth and Justice irrespective of the circumstances that may be present. So, you go to your master request him to give what is needed, to perform the funeral of our son and return to this place." As Chandramathi turned her steps to her master's house with a heavy heart she came upon a handsome male child lying on the way. On seeing the child she was immediately reminded about her died son, so she immediately put him over her shoulders and started weeping bitterly. At the same time, Kaasi (Varanasi - Banaras)rajan's child was lost so his guards came in search of the lost child. (Prince) Where Chandramathi was making her way through the woods with the prince (Kasi Raja's child) over her shoulders, the guards who saw Kaasi (Varanasi - Banaras) Raja's child over Chandramathi's shoulders concluded that it was Chandramathi who had stolen the child (Prince) and had killed him. So, they took her to their King. The King did not conduct an investigation into the matter of his child's death, but blindly confirmed that it was Chandramathi who had murdered his child in cold blood and so he ordered the guards to get her beheaded. At once Kaasi (Varanasi - Banaras) Raja's men said about the allotted task by telling Veeravaagu that the King has passed orders to get Chandramathi beheaded by chief guard of the graveyard namely Sre Harishchandra (Sathya Harishchandra) . Sre Harishchandra (Sathya Harishchandra) knew that Chandramathi was innocent of the crime, but decided to carry out the orders of the King. Sre Harishchandra (Sathya Harishchandra) asked Chandramathi to show her neck in order to perform the allotted task and raised his sward. At that instant Sage Viswamithra prevented him from from laying his sward on her neck. 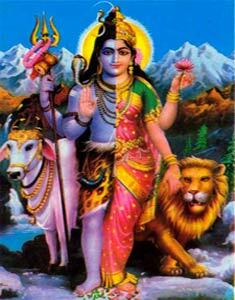 Sage Viswamithra said," You know that Chandramathi is innocent of the crime. Is it not wrong on your part to kill an innocent person? Therefore do not kill her. Sre Harishchandra (Sathya Harishchandra) replied that he knew Chandramathi was innocent of any crime, but he was bound to obey the orders of the King and at the same time he had to be loyal to his master and his service. 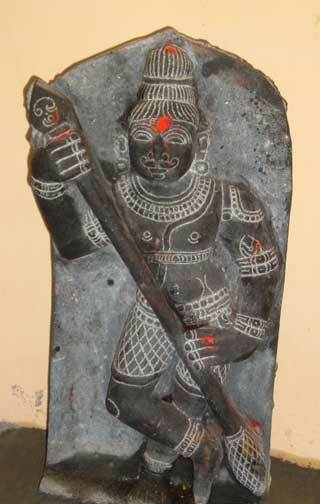 Thus, as a main guard of the graveyard of Kaasi (Varanasi - Banaras) he confirmed that it was right to kill Chandramathi. With these words Sre Harishchandra (Sathya Harishchandra) raised his sward, which to his utter astonishment did not cause a wound when it dropped on her neck. But in place of the wound there was a flower garland. Thus, Sre Harishchandra (Sathya Harishchandra) failed in his second attempt of killing Chandramathi. Sre Harishchandra (Sathya Harishchandra) was disappointed because he could not execute the orders of the King. So, with great devotion and humility he prayed to "Lord Umaamageswaran"(God Viswanaathar and his consort Goddess Visaalaakhshi) who exercised there over lordship over Kaasi (Varanasi - Banaras). He said,"O God, I honestly abide by the principles of Truth and Justice. Therefore when I lay my sword on Chandramathi's neck for the third time, both of you must extend your support to me and help in my endeavor to behead her". He then raised his sword for the third time and was about to lay it on Chandramathi's neck. All of a sudden he started saying to himself," Behold! Oh what a wonderful sight!" As he was saying so, the sword dropped from his hands and their own accord he joined his hands as a mark of adoration. Visaalaakhshi the mother of the world and Viswanathar the father of the world ("Lord Umaamageswaran") who appeared before him seated in a coach driven by oxen and surrounded by the whole class of Celestials. "Lord Umaamageswaran" looked at Harichandra (Sre Harishchandra) and said,"O My son Harichandra! The protector of Truth and Justice! Truth has triumphed. Console yourself! Your wife is innocent of any crime. That was the reason why you could not kill her. Truth and Justice present ordeals in one's life in order to test his adherence to Truth. But they never fail to extend their hand in protecting you from all evils. In order to prove that you are the only person in all the fourteen worlds who adheres to Truth and Justice you were subjected to various ordeals. It was the Celestials who put your Truth to tests. You have succeeded in establishing your reputation as the only person who maintains Truth and Justice. The place, which you guarded, is not the graveyard. It is a place where rituals were performed. You firmly believe that your son Logidaasan and Kaasi (Varanasi - Banaras) Raja's son are both dead. But on the contrary they are not dead. They are playing with my sons Lord Muruga and Lord Vinayaga in my heavenly abode of Sreekailash. So saying, they passed orders to bring Logidaasan and Kaasi (Varanasi - Banaras) Raja's son to the place in. As commanded, Logidaasan and Kaasi (Varanasi - Banaras) Raja's son were brought into the presence of "Lord Umaamageswaran" and the children were blessed with all good fortunes. "Lord Umaamageswaran" who was greatly pleased with Sre Harishchandra (Sathya Harishchandra) said," The King of Ayodhya that is believed to have been lost (by yourself) is still yours. It has not passed into the hands of anyone else. Your Prime minister 'Sathyakeerthi' who is a sincere follower of the principles of Truth and Justice is ruling it. You may ascend the throne of Ayodhya and continue to rule in a righteous way. "Lord Umaamageswaran", then blessed Harichandra (Sre Harishchandra) with all good fortunes. Having witnessed a heavenly scene before his eyes, his joy knew no bounds. In his humble request to the" Lord Umaamageswaran" he said, "Kindly entrust Ayodhya to the hands of my son Logidaasan.Let me retire from my service as a king. This is my first appeal. "Lord Umaamageswaran" decided to fulfill the wish of 'Sre Harishchandra (Sathya Harishchandra) '. So, with the blessings of "Lord Umaamageswaran" and with the Celestials surrounding him Logidaasan was crowned the King of Ayodhya. 'Sre Harishchandra (Sathya Harishchandra) ' then looked at "Lord Umaamageswaran" and said," I thank you for having fulfilled the first appeal. I now wish to submit another appeal at your holy feet. He said,"Oh God! I have spent many years of my life in this graveyard. I do not want to leave this holy place. Therefore offer me a job which would enable me to extend my over lordship over this graveyard in the years to come. Lord "Umaamageswaran" who was ready to grant Sre Harishchandra (Sathya Harishchandra) any thing he wished for said,"Oh Sre Harishchandra (Sathya Harishchandra) ! Right now, I promote you to a higher status namely 'God', the sole protector of the graveyards on earth." Every soul that meets death must bow down to you seeks your permission and according to your instructions the soul will attain its next state. Based on the deeds of the past birth every soul that comes to you shall attain any one of the four states- (1) Salvation (2) rebirth (3) Spirit (ghost) (4) bearer of sufferings in hell. You must submit a copy, which contains a detailed account of souls that come to you and the states that they should attain to Lord Chithragupta (The chief accountant of the Divine kingdom who maintains the main accounts of deeds of all soles). At last "Lord Umaamageswaran"said,"May You make use of the boon offered to You, lead an everlasting life with bearing your virtuous wife Chandramathi in your soul and discharge your duties to my entire satisfaction on earth". With these words "Lord Umaamageswaran" disappeared and left for his heavenly abode of SreeKailash. Sre Harishchandra (Sathya Harishchandra) obeyed the Holy command of God by discharging his duties to the entire satisfaction of "Lord Umaamageswaran". From then on, in every graveyard on the earth, every time a corpse is brought to the graveyard. Sre Harishchandra (Sathya Harishchandra) was worshipped, Devotional songs on the principles of Justice Uttered through the sacred lips of the Sage Sambuga were sung -songs which emphasize that souls which have done such kinds of good deeds would attain such greatness and souls which have done such kinds of evil deeds would bring ruin to themselves. Then, Harichandra (Sre Harishchandra)'s permission was obtained, before the cremation or burial of the body (corpse) took place. Thus we see that, the good deeds and bad deeds are taken into account and verified by Sre Harishchandra (Sathya Harishchandra) and the next stage of the soul is determined. In the present world people who do not realize the greatness of Sre Harishchandra (Sathya Harishchandra) , keep a brick or granite stone consider it as a symbol for Sre Harishchandra (Sathya Harishchandra) and worship it. The Supreme Preceptor of the Universe - "Sre Kagabujandar " has advised his disciple that, since Harichandra (Sre Harishchandra), the God and the sole protector of Truth and Justice is not worshipped in the proper manner, people do not adhere to the principles of Truth and Justice these days.